O Mary, Virgin most powerful and Mother of mercy, Queen of Heaven and Refuge of sinners, I consecrate myself to thine Immaculate Heart. I consecrate to thee my very being and my whole life; all that I have, all that I love, all that I am. To thee I give my body, my heart and my soul; to thee I give my home, my family, my country. We desire that all that is in me and around me may belong to thee, and may share in the benefits of thy motherly benediction. And that this act of consecration may be truly efficacious and lasting, I renew this day at thy feet the promises of my Baptism and my first Holy Communion. I pledge myself to profess courageously and at all times the truths of our holy Faith, and to live as befits a Catholic who is duly submissive to all the directions of the Pope and the Bishops in communion with him. I pledge myself to keep the commandments of God and His Church, in particular to keep holy the Lord's Day. I likewise pledge myself to make the consoling practices of the Christian religion, and above all, Holy Communion, an integral part of my life, in so far as I may be able so to do. Finally, I promise thee, O glorious Mother of God and loving Mother of men, to devote myself whole-heartedly to the service of thy blessed cult, in order to hasten and assure, through the sovereignty of thine Immaculate Heart, the coming of the kingdom of the Sacred Heart of thine adorable Son, in my own heart and in those of all men, in our country and in all the world, as in Heaven, so on earth. Amen. "I, a faithless sinner, renew and ratify today in thy hands, O Immaculate Mother, the vows my Baptism; I renounce Satan, his pomps and works; and I give myself entirely to Jesus Christ, the Incarnate Wisdom, to carry my cross after Him all the days of my life, and to be more faithful to Him than I have been before." In the presence of all the heavenly court, I choose thee this day, for my Mother and Mistress. I deliver and consecrate to thee, as thy slave my body and soul, my goods, both interior and exterior, even the value of all my good actions, past, present, and future; leaving to thee the full right of disposing of me, and all that belongs to me, without exception, according to thy good pleasure, for the greater glory of God, in time and in eternity. Amen. O Adorable Heart of Jesus, the tenderest, the most amiable, the most generous of all hearts! 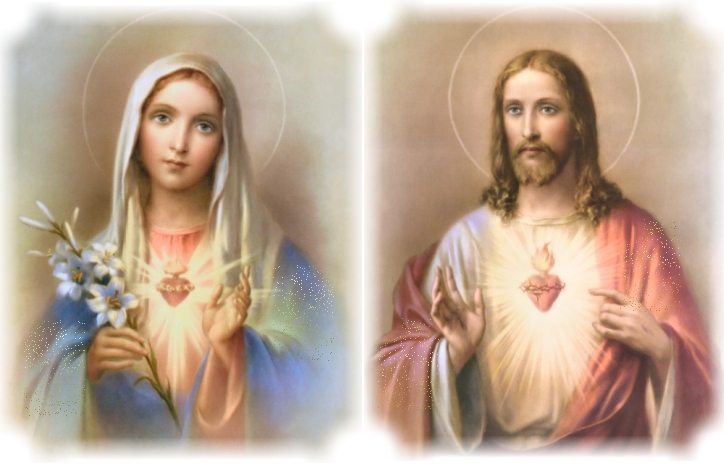 The Back button takes you to Mary's Index and the Forward, to the Sacred Heart.